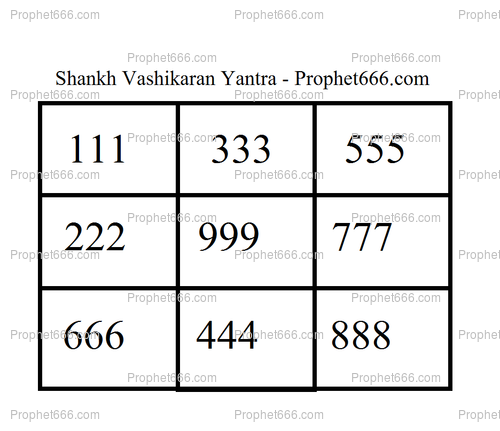 The Yantra Experiment is believed to gather strength if performed on any day nearer to Purnima or Full Moon. The Prayog can also be performed on the day of Purnima. The practitioner should perform the experiment at the time of Sunrise, after bathing and wearing clean clothes. He should spread a Yellow Colored Cloth in front of him and place a small sized Dakshinavarti Shankh on the cloth. Before placing the Dakshinavarti Shankh on the Yellow cloth, the practitioner should bathe it in Ganga Jal or fresh and clean drinking water. In past articles, I have written extensively about the strong Voodoo paranormal powers of the Dakshinavarti Shankh, which is a sacred Hindu Religious Symbol, related to Bhagwan Vishnu. 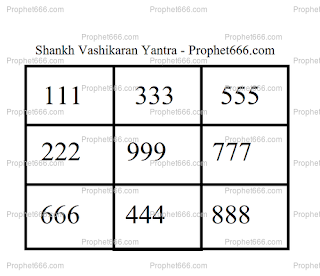 The practitioner should then, using a pointed wooden stick draw the simple numerical Yantra showing in the image included in this article, on the back of the Dakshinavarti Shankh using a paste, which has been prepared by mixing a few drops of water with Kumkum. He should then, light a Pure Ghee Diya and Dhoop in front of the Dakshinavarti Shankh and say a small prayer from a bottom of his heart seeking a resolution of the specific problem faced by him or his family. Finally, he should wrap the Dakshinavarti Shankh, in the same Yellow colored cloth and place it in his Puja Place. The Dakshinavarti Shankh, should remain in the Puja Place until the problem or difficulty is resolved. After, which is should be immersed in any flowing water body. The experiment can be performed by either the husband or wife. Even though, I have called it a Vashikaran Prayog, the experiment can be used to resolve a wide range of problems, including those mentioned in the first paragraph.